How long does it take to reach paradise? The journey usually starts with an overnight flight and a frustrating connection. A smaller airplane, a drive to the coast, and a boat ride usually follow. It can add up to 24 hours—a full day of vacation—before you dock at your island resort. That’s a long time to wait for a rum-filled welcome drink to be placed in your hand. What if you cut out—or at least greatly reduce—the first part of your trip? That’s right, no overnight flight. It’s been replaced with a quick (and direct from many cities in the United States) flight to Panama City. You seem surprised that paradise could be in Panama. Don’t be. 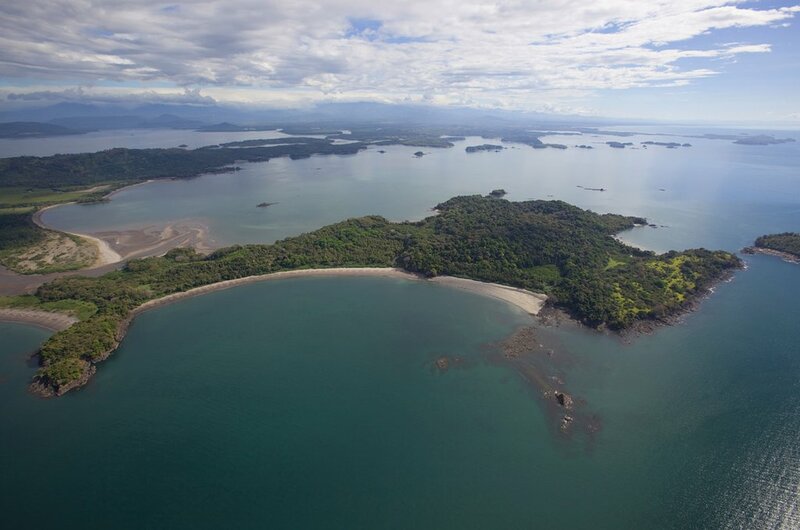 The Central American country sits in between two countries, Colombia and Costa Rica, that are famous for their beaches. Chiriquí, a province bordering the latter, may be known for its high peaks and political history, but it also has some of the country’s most pristine beaches. Plus volcanic islands, home to tropical forests and fascinating animals, lie just off the Pacific coast. Isla Palenque is one of those islands. The 400-acre island is a 15-minute boat ride from Boca Chica, the jumping-off point for the islands in the Gulf of Chiriquí. Pre-Columbian tribes used it first as a farming community and then as a sacred site for holy ceremonies. Their artifacts are still being discovered amidst the dense jungle that now covers the interior. Families of howler monkeys and white-nosed coatis, nine-banded armadillos and plumed basilisks live here, too. Mangroves, lagoons, and seven beaches—yes, seven—line the coast. 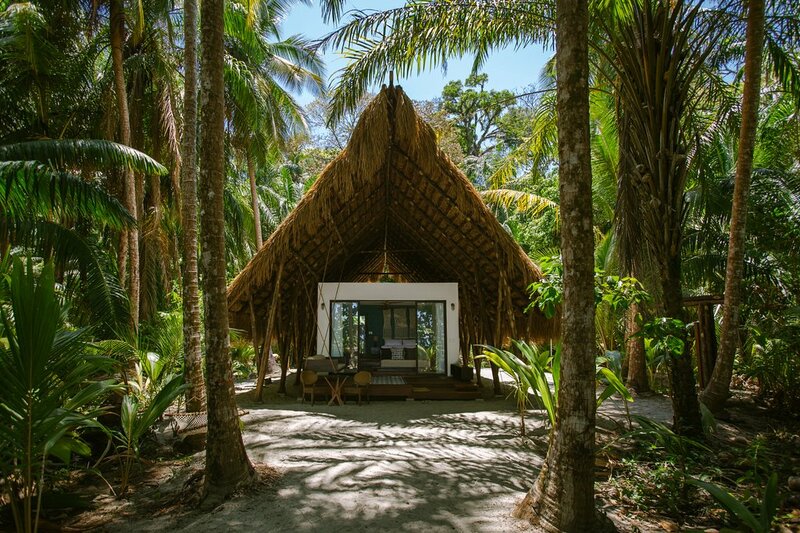 A little resort is hidden inside this gorgeous island. Eight beachfront casitas sit on Playa Palenque on the west side of the island. A single villa, perfect for families, was built on the east coast’s Playa Primera. Together—along with an open-air restaurant, a beach bar, and a pool—makeup Isla Palenque Resort. After arriving in Panama City, you fly another hour to David, transfer for 45 minutes to Boca Chica, and ride 15 minutes across emerald water. A cold cocktail awaits you in the thatched arrival pavilion. An electric GEM vehicle then drives you across the island to your hidden, thatched-roof casita. It’s adorable. A wooden deck is outfitted with a patterned rug and a swing couch. Sliding doors lead into the tiered bedroom. It has a single turquoise wall, a king-size bed, and double armoires. An open-air bathroom, with a bamboo rainfall shower surrounded by a garden, is also out back. You quickly check out your casita’s amenities—they include an iPad and a locally stocked minibar—before rummaging through your carry-on bag for a bathing suit. You change, head back outside, pass a bed hammock strung between four trees, and race down to the beach. No one else is there. It feels like you have the entire island all to yourself. It would stay that way if your stomach didn’t remind you about lunch. So you head over to Eden for a late meal. Though the menu changes daily, the food is always organic and locally sourced. Seafood lovers have the most options. You go back and forth between grilled langoustines and fish tacos with mango-jalapeño relish. The tacos ultimately win—at least for today. Just add a fruity cocktail for a perfect welcome to the island. Paradise really isn’t that far away.